Dark matter is one of the basic ingredients of the Universe, and searches to detect it in laboratory-based experiments are being conducted since decades. However, until today dark matter has been observed via its gravitational interactions that govern the dynamics of the Cosmos at all length-scales. Dark matter is a big theme of the Oskar Klein Centre, both for theorists and experimentalists. In 2014, with a grant of the Knut and Alice Wallenberg foundation, OKC has joined an international collaboration, called XENON, that builds and operates detectors to find the elusive dark matter particles in the laboratory. 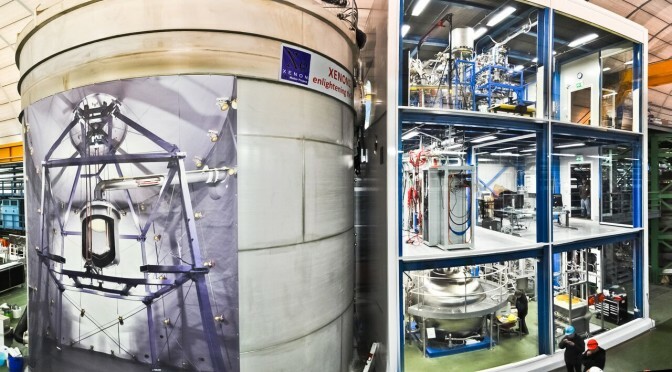 The latest incarnation of the XENON detector, which is the most sensitive dark matter detector existing, has been inaugurated November 11, 2015 with a party attended by about 80 scientists, funding agency representatives and VIPs, e.g. the Swedish ambassador to Rome, Robert Rydberg. Why the ambassador in Rome? The detector at the Laboratory Nazionali del Gran Sasso (LNGS), one of the largest underground laboratories in the world. Here 1400 meters or solid rock shield the detectors from cosmic ray particles which would otherwise flood the detector with rubbish signal. Principle of operation of a dual-phase Xenon TPC. A particle interacts with liquid xenon, the nucleus recoils and produces scintillation light and electrons. The elecons get drifted towards gas phase xenon, where a proportional scintillation signal is produces. The light is detected by photomultiplier tubes. 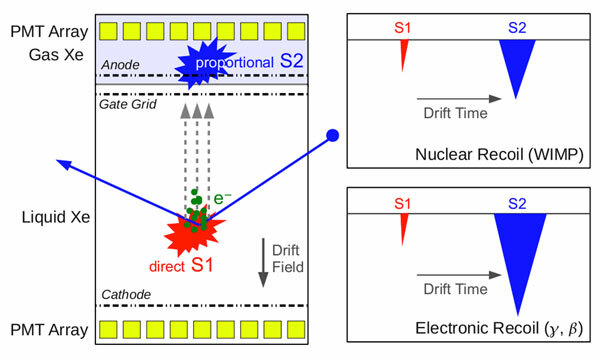 The relative sizes of prompt and delayed signal can help to distinguish (electromagnetic) background from the nuclear recoils we are interested in. As the name indicates, the detector is made of the noble gas xenon. The main idea is that dark matter particles, assumed to be stable relics of the Big Bang, will every once in a while interact with xenon nuclei. The nucleus will then recoil. A particle detector called Time Projection Chamber (TPC) can be used to detect this recoil. Our TPC consists of roughly 1 tonne of xenon, contained in a cylinder of 1 meter diameter and 1 meter height. In liquid phase the recoiling xenon atoms ionize and excite neighboring atoms. When these dexcite scintillation light is produced. The ionized electrons are drifted (by means of an electric field) to a gas-phase Xenon where they give rise to a secondary light signal, which is delayed by a few micro-seconds. The light is observed by 248 photosensors. The principle is illustrated in figure 1. As the dark matter is elusive we only expect about five or so recoils due to dark matter particles in one tonne of xenon per year! Therefore, the number one enemy is a background of recoil signal sinduced by other particles or noise in the detector. Most of the work deals with reducing it. Luckily we have a few ways to reduce it. The ratio and size of the prompt and delayed signal yield information on the type of interaction that happened, helping to distinguish precious signal from trash. The time between the prompt signal, as well as the patterns of signal in the PMT arrays can be used to reconstruct the position of the interaction in three dimensions, allowing only to consider recoils happening in the center of the TPC, which are less likely to come from background. The Xenon gas itself is highly purified, using cryogenic distillation techniques specially developed for the purpose. Similarly, all components of the detector have been screened for radioactive contamination using ultra-sensitive dedicated detectors. And also the TPC is situated in a huge water tank, about 10 meter in diameter, which is equipped with photosensors, detecting light produced by the Cherenkov effect of the relativistic particles inducing a possible background. Any event in the detector that has also a signal in this water tank is vetoed. Such a complex detector can not be build by only a few physicists. Apart from us, the XENON Collaboration consists of 21 research groups from the US, Germany, Italy, Switzerland, Portugal, France, the Netherlands, Israel, and Abu Dhabi. In total about 130 physicists are involved. OKC’s main responsibility is to build and operate the European analysis facility for performing the tricky analysis of finding the few interesting dark matter recoils in the ocean of fake signals, truly a task of finding a needle in a haystack. The facility will be hosted by the Parallel Data Centrum at KTH. Meanwhile, we tried to make ourselves useful: OKC researcher Alfredo Ferella has been the analysis coordinator and run coordinator for the 1T predecessor, XENON100, a similar but much smaller detector, which aside the comparable LUX detector in the US, provided the most stringent constraints on dark matter to date. 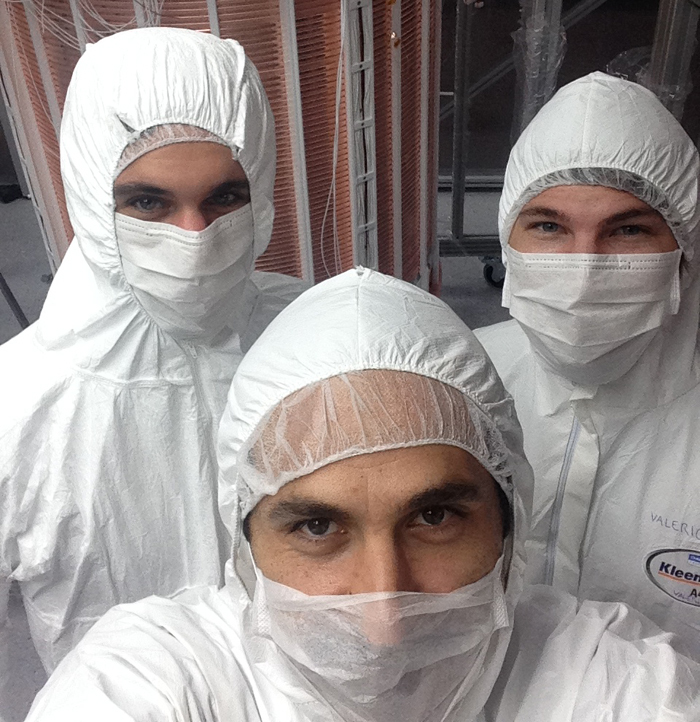 We also helped to estimate XENON1Ts sensitivity and spend a few days to assist in the final construction steps of the TPC, see picture below. Now that the detector has been completed, we can start preparing for analysis. The next couple of month will be spent in getting the detector ready and fully understood to start taking data for the dark matter search. We expect XENON1T to be about 100 times more sensitive than the most sensitive detectors today, so as Elena Aprile, the founder of the XENON project, put it: we hope we will discover the damn thing.